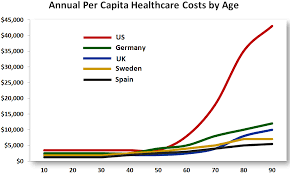 If you are like all small business, health care costs are killing you; literally. The never ending double digit increases are sucking the lifeblood out of your business. A company of 20 people could be incurring a bill of over $15,000 per month that’s $180,000 per year. How many productive employees could you hire for that amount? How many employees can you give merit raises, how many advertising campaigns, trade shows, and the list of possibilities goes on and on. There are several fancy new hip ways to save money on health care and I’ll leave you to discuss with your Insurance professional, but I’m going to suggest two ways; both unpopular but in this day and age both worth a second and third look. 2. Catastrophic Health Insurance vs. traditional Health Insurance. Employee cost sharing is becoming more and more popular as businesses find they can no longer burden the entire cost. Sharing costs is a company by company decision, but I’ve seen 25% of the single rate to 25% of the entire rate per employee to 100% for employee and 0% for additional family members. Whatever is decided, look at your own demographics, your industry and local competitors and then businesses in general in your area. Make your decision based on all three parameters, so when the employees gripe, you have comparatives. Let me explain. Let’s say you spend for a single person $750 a month on insurance. That’s $9,000 per year. We’ll say you have an HMO, so there is no or limited out-of-pocket and you have to use the plan’s hospitals and doctors. If your employees are healthy, they probably don’t need and don’t spend a large amount of money on doctors, drugs, etc. What if you could spend $375 per month, but have a deductible of $4,500. If a major catastrophe occurs, after you pay $4,500 the insurance kicks in the same as with the normal plan. In all likelihood, you’re going save $4,500 per year. Next Post: Do you know what business you’re in? Bookkeeping – why not use the professionals?